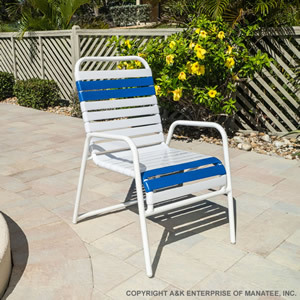 The C50 Strap Patio Dining Chair is a highly recognizable strap chair that is the standard in commercial pool furniture. Crafted from extruded aluminum tube and featuring a brace under the seat for design reinforcement, the C50 Strap Patio Dining Chair is offered at a discount price with a commercial warranty. Commercial grade features include a powder-coated aluminum frame, double-wrapped 2 inch vinyl straps, extra bracing, and stacks easily for storage. Custom made to match your property.